As an identical twin it was always a challenge going through school. Initially my brother and I had to deal with the fact that our teachers could not tell us apart. My grandmother rectified this problem by outfitting each of us with belts that had our first initial on them. As we aged beyond the elementary years, teachers began to tell us apart better as some slight differences in appearance began to take shape as well as some major shifts in personality. Thank goodness for that, as we would never have survived through the middle school years if we were still forced to wear those belts. The second challenge came in the form of academic achievement. For my twin, learning and success, based on traditional metrics, came very easily. It seemed to me at least that he did not have to put in much effort to earn high marks on assessments. Obviously my stance on grades and learning has changed a great deal since then, but this nonetheless posed yet another challenge of being a twin. I had to study twice as long or longer just to earn a B in many of the same classes where my brother got an A. School came much easier for my brother. My saving grace came in the form of some amazing teachers. I loved the life sciences, particularly biology. My love for science eventually led me to pursue an undergraduate degree in marine biology. This genuine interest took hold in the 7th grade thanks to Mr. South, my science teacher. As I got to high school I still had a strong interest in science, but struggled in certain courses such as chemistry and anatomy/physiology. The struggle was amplified as my brother excelled in both courses. Ah, the joy of going to a small school. Thankfully for me Dr. Raymond Hynoski was the teacher of both these courses. He was a quirky fellow at times, but someone who had a firm grasp of the content and helped students master the concepts. Each of his classes was filled with humor, relevance, and inspiration that everyone in the class could be a chemist or doctor. His most endearing characteristic was how he consistently went above and beyond to let all his students know that he cared. Each day I looked forward to attending his classes even if I struggled. I might not have done as well as I would have liked in his courses, but I tried hard and Dr. Hynoksi was able to emphasize even the slightest successes in my efforts to learn the concepts. I had to take chemistry. It was not a choice. Anatomy and physiology was an elective that I only signed up for because Dr. Hynoski was the teacher. There are many lessons that caring educators such as Dr. Hynoski teach us. So much pressure is placed on teachers and administrators to achieve at all costs. Rankings, stakeholder perceptions about the importance of standardized test scores, and honor rolls do nothing but make this issue worse. This is unfortunate as grades and scores are not what students will remember. What will resonate with students long after they have passed through our schools are the educators who believed in them. The ability of educators to provide hope and encouragement that inspire learners to follow their dreams and aspirations provides a priceless value that is not often acknowledged publicly, but greatly appreciated privately. The power of empathy and the act of caring could mean the difference between a child sticking out school or dropping out. School to many children serves as a refuge from the harsh world that is their unfortunate reality. It could also provide invaluable lessons that fuel a career path that might never have been imagined. Showing that you care daily takes only a little effort, but the potential payoff is much more valuable than what you could ever receive in a monetary sense. All kids have greatness hidden inside them. It is the job of an educator to help them find and unleash it. Show that you care especially as students struggle. You can never care too much. Thank you to Dr. Hynoksi and many of my other teachers for teaching me what truly matters in life. As adults we must not forget the power of showing each other we care. Positive encouragement and support go a long way in helping others cope with the challenges of life while building lasting relationships. Take the time to mail a card, make a phone call, or send an electronic form of communication not just to those in need, but to others on a whim. In my opinion, there is not a right or wrong way to care…. we just need to make more concerted efforts to do it regularly. Let’s face it, school, as we know it is driven by grades as the main reflection of what students do, or do not, know. What has resulted is a rat race of sorts where many kids and parents alike have their eye on the prize. 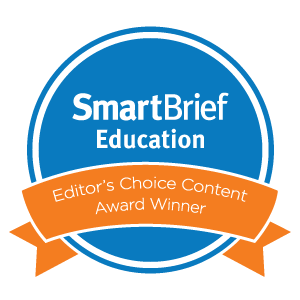 The prize in this case is either a coveted letter or number grade that is celebrated above the most important aspect of education – whether a student actually learned and can apply this newly constructed knowledge in meaningful ways. Micro-credentials, although a step in a better direction as a means to make feedback more personal, can also perpetuate this problem. Grades tend to diminish students’ interest in whatever they’re learning. Grades create a preference for the easiest possible task. Grades tend to reduce the quality of students’ thinking. Grading perpetuates a bigger problem. If students come through our doors each day to just "do school" then we have already failed them. By failure I mean a blatant disregard for providing them with the necessary skills, behaviors, and qualities that a grade could never quantify. Grading is a major component compelling kids to just go through the motions and “do” school. Learning, not grades, should be the reward for students. Helping them recognize this is the challenge we must all accept. 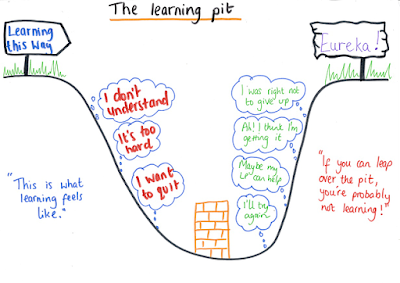 I recently came across the learning pit concept and it immediately resonated with me. With learning as not only the goal, but also the final outcome, students are guided through a process that illustrates how learning is the ultimate reward. When grades are thrown into the mix the focus becomes a path of least resistance, negating the positive outcomes associated with students experiencing the learning pit. What is the hard truth about traditional grades and how they are currently used? In this day and age I think grades are more for parents and schools than they are for the students we are trying to serve. Learning is not only a messy process, but it the path also varies greatly from student to student. All kids learn differently and possess different and unique abilities to show us that they understand concepts. Makerspace work and projects that students engage in are a great example of this point. 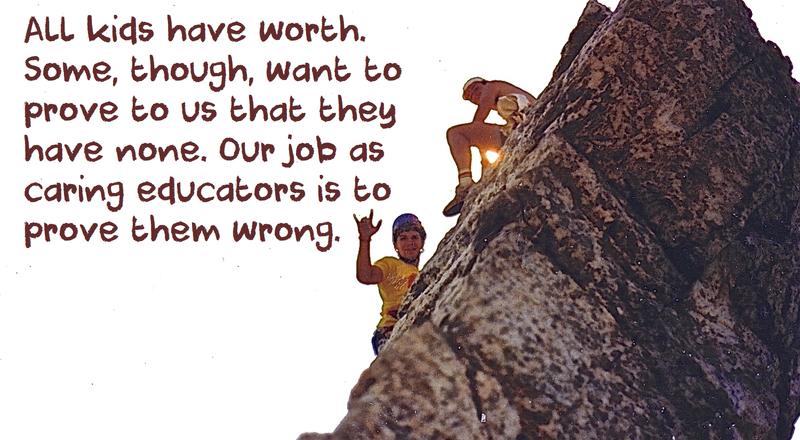 Students do to learn through trial and error, failure, collaboration, cross-disciplinary connections, taking risks, and overcoming certain fears that grades bring about. The ultimate reward is making something that does something and in many cases this is a workable solution to a problem they identified. I think we are a long way off from abolishing all grades. That doesn’t mean we can’t critically reflect on the role grades play and how they are calculated. If the true goal of schools is learning then that should be reflected somehow in a grade. We must begin by developing better formative and summative assessments that move away from students telling us what they know and instead show us that they understand. 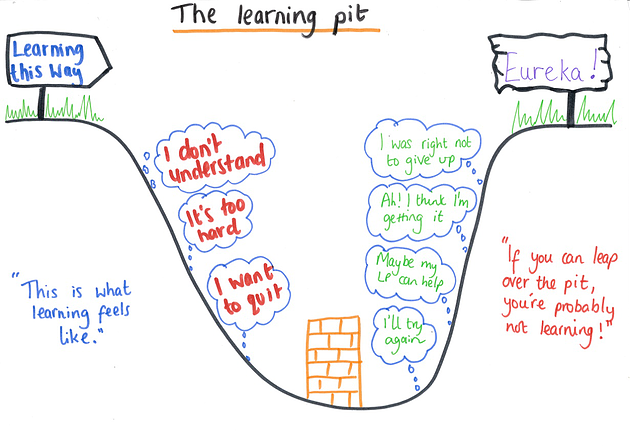 A mindset shift is also needed where students work and think in ways that allow them to experience the inherent rewards of entering and exiting the learning pit. This is Quad D learning at its finest. Let’s face it – great things occur in all schools on a daily basis. We see the fruits of our labor through our students as they show growth in learning over time. There is nothing more gratifying as a servant of education then when our passion translates into helping students of various ability levels accomplish tasks that they themselves never thought possible. There are countless stories to be shared that illustrate how schools are meeting the diverse needs of learners today while preparing them for success in their future. Telling these stories adds another layer to initiatives and strategies developed to empower students and energize a community of stakeholders. The good news doesn’t stop there. Teachers, administrators, and parents go above and beyond to serve kids and the profession. Each story told helps to establish a new reality instead of one that historically has been dominated by perception. As I have been writing since 2009, if you don’t tell your story someone else will. When someone else controls the narrative, chances are it might not paint an accurate picture of what is truly happening in your classroom, school, or district. Embracing a storyteller-in-chief mindset should no longer be optional, but instead a decision grounded in the benefits of being transparent and building powerful relationships with stakeholders (parents, media, businesses, community members, etc.). This is the premise behind brandED leadership. The categories above are what I used and provide a frame of reference to create your own template. Each month I would send the template out and ask my teachers to share any pertinent work. 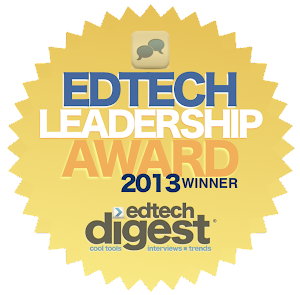 Everything was then curated into a final document, edited twice, and then sent out to my stakeholders using Twitter, Facebook, LinkedIn, Google+, Remind, our school app, and an email blast. The final product was nothing fancy, but loaded with valuable news and insights to show everyone in our community the great work happening inside and outside the walls of our building. Check out an example HERE. Want to share content like this across multiple social media platforms with one tool to save time? If so check out IFTTT. Want to program specific times to send out tweets and other social media messages? Well there are tools for that as well. Check out Buffer and Hootsuite. The report became an invaluable resource for me to pull content into other digital channels and further amplify the work taking place at my school. 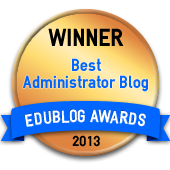 With my teachers permission I copied and pasted excerpts and worked the content into more elaborate blog posts. You could even apply the same concept to Smore. 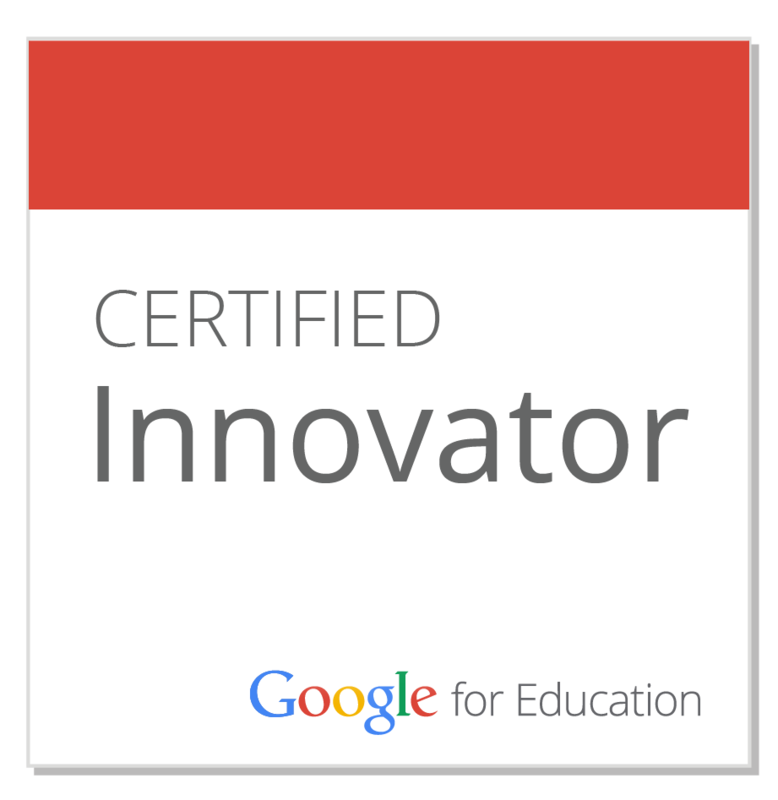 I also began to incorporate the ideas, strategies, and innovative practices into presentations I was delivering both at the local and state level. When video and pictures are incorporated you ultimately develop a digital leadership strategy that not only gets the good news out, but does so in a way that builds a positive brand presence. For more tips and ideas on how this equation can help you get the good news out click HERE. 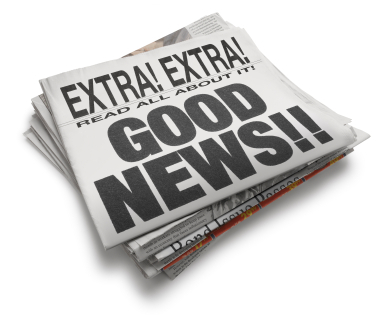 What other ways are you leveraging to get the good news out on your classroom, school, or district?